KIEV, Ukraine -- Through years of political upheaval and economic turmoil, Ukraine’s capital city, Kiev, has remained a vibrant, engaging place to visit. For travelers, its food and culture rival the best of Europe at a fraction of the price. 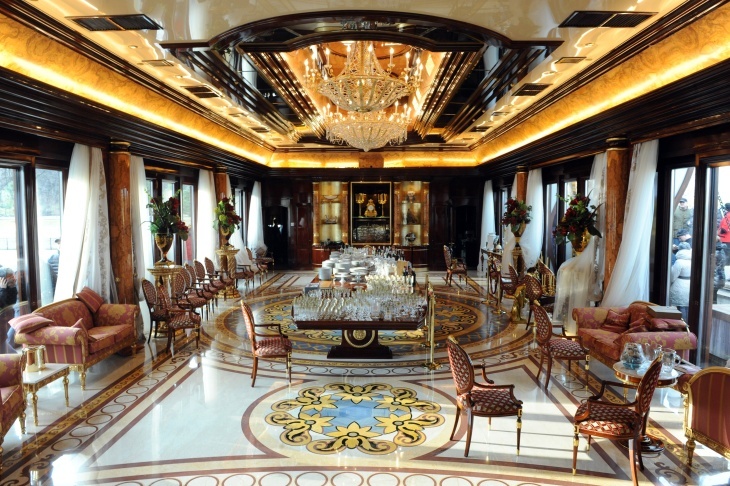 Photo shows a view of the interior of the Mezhyhirya, the private residence of ousted Ukrainian President Viktor Yanukovych, near Kiev. Maidan: This square was the site of deadly protests in 2014 that ushered in the country’s pro-European revolution. It’s now a bustling tourist hot spot surrounded by shops, restaurants, an evening fountain show, the towering Independence Monument and the Instagram-ready I Love Kiev sign. Saint Andrew’s Church: This 18th century Baroque stunner by Italian architect Bartolomeo Rastrelli is worth a visit. Afterward, head to the nearby Landscape Alley, a whimsical sculpture park and kids play area. I dare you not to snap a selfie with one of the massive mosaic creatures. St. Sophia's Cathedral: The gold- and green-domed UNESCO World Heritage Site offers an impressive collection of original 11th century mosaics and frescoes. The Motherland Monument: This tremendous 500-ton, 335-foot (102-meter) stainless-steel structure on the bank of the Dnieper River keeps a watchful eye over Kiev. The grand statue, a woman raising a shield in one hand and a sword in the other, commemorates the Soviet Union’s defeat of the Nazis during World War II. A Ukrainian war museum is located at its base. Puzata Hata: Get your fill of borscht, a hearty soup often made with beets or cabbage, and other Ukrainian dishes at this popular and cheap fast-food chain. Don’t skip the dessert line at this cafeteria-style gem. Yaroslava: If looking to refuel between sites, stop by this historic Ukrainian restaurant and bakery for traditional treats including their famed cinnamon rolls. The cranberry cake is also worth a mention. Three yummy pastries and two fresh juices cost $3 (U.S.). It’s located at Yaroslaviv Val St., 13. Chicken Kiev: Where better to sample the famous dish (not actually from Kiev!) than its namesake restaurant located near Maidan? You’ll be transported to Soviet high society of 1970s in the retro eatery, serving dozens of chicken dishes, inducing the famous Kiev with its breaded outside and herbed butter center. Dive into a lavish three courses for two for under $30. Lesnaya market: If thrifting is your thing, head to Lesnaya flea market and journey between mountains of secondhand clothes and stalls of flowers, produce and knockoffs. The market is located outside Lisova metro station, the last stop on the Sviatoshynsko-Brovarska Line. Yes, you can visit the site of the world’s worst nuclear accident, the Chernobyl disaster, which led to the evacuation of about 115,000 people. Armed with dosimeters, you’ll traipse through abandoned towns, schools and an amusement park and check out the site of 1986 explosion that sent a radioactive cloud over Europe. Pripyat, a hastily evacuated Soviet city, was ravaged by looters and left as a modern-day ghost town. The story of the massive (you must see it to believe it) Soviet missile-detection system, Duga-1, is also a worthy stop on any Chernobyl trip. Marvel at the sprawling, opulent estate of ousted President Viktor Yanukovych located on Dnieper river, 15 miles (24 kilometers) north of Kiev. Many consider the impressive 350-acre (142-hectare), once-secret, walled complex a sobering symbol of excess and corruption by the Russia-friendly Ukrainian leader driven out during the 2014 protests. You could lose an entire day wandering Mezhyhirya’s manicured gardens, golf course and impressive classic car collection. Colorful tours of Yanukovych’s massive lodge-style home, complete with spa, tennis courts, bowling alley and salt room, are led by the home’s lively caretaker, Petro Oliynyk. For English translation, you’ll need to hire a guide in advance or pick one up onsite. Transport plus a three-hour tour with Argotour cost $77. Entrance to the home is an extra $10 per person. You can hail a taxi, but be prepared to negotiate the rate. Ordering a cab by phone or online from an established company will ensure a better price. Uber is cheap but can include long wait times, and it’s surprisingly difficult to connect with drivers. Your best bet is the subway, which roars through Kiev’s metro system with impressive efficiency. You can pick up single-ride tokens for around 15 cents U.S. or buy multi-day passes.